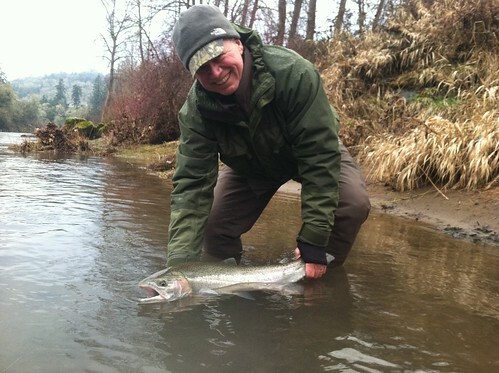 The next six weeks is prime time on many of Oregon’s winter steelhead streams. A lot of our rivers have had good numbers of both wild and hatchery fish show up early, which is a good barometer of things to come. 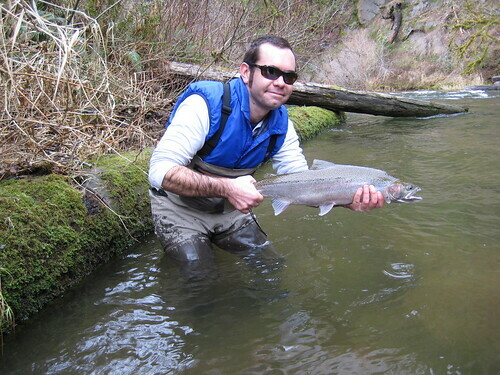 This week’s rains will bring river levels up again, which should bring more fish into the streams. We have had a remarkably mild winter thus far, which has made the on-stream conditions much more pleasant than they usually are in January. 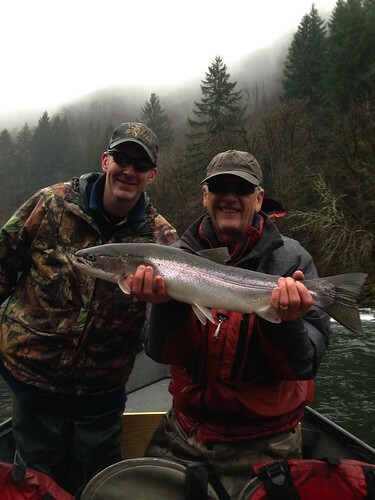 Though the light snow pack may lead to low water this summer, it is a rare pleasure to be able to feel one’s fingers and toes all day while chasing winter steelhead. Also, warmer water temperatures generally make the fish more responsive. 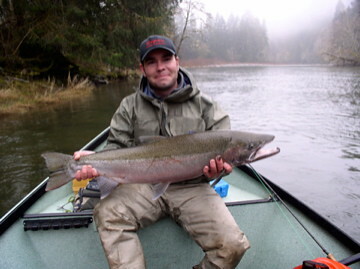 This perfect specimen fell for a weighted egg pattern fished about six feet below a strike indicator. 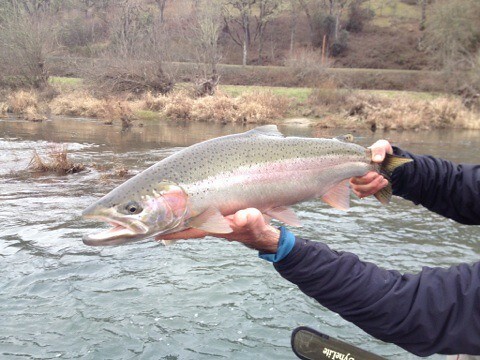 This fish of 8 or 9 pounds, though not a giant, is about as beautiful as they come. 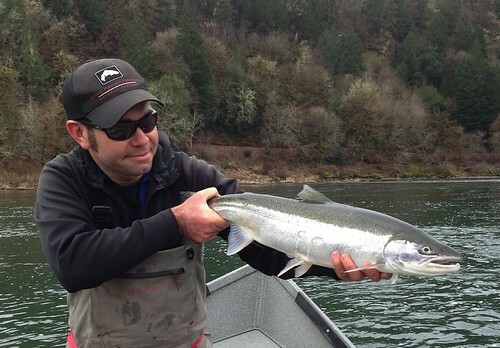 The next six weeks are the prime of Oregon’s winter steelheading. 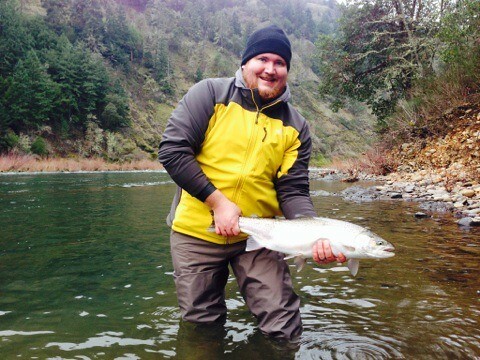 It’s time to wake up early, layer up, and make your way to the river to chase these amazing fish. It will be over soon, so now is the time to get out there and make some memories. 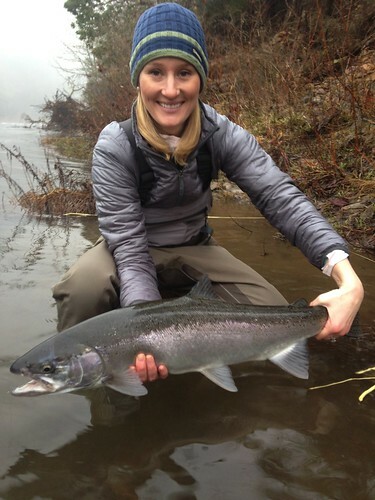 With December comes the advent of the Winter Steelhead season. 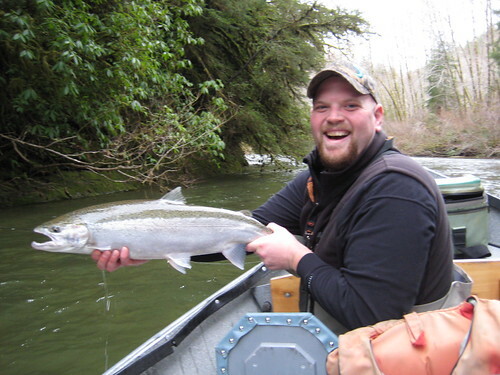 One of the most exciting things about this time of year is that nearly every river and creek along the Oregon coast gets at least some returning adult steelhead. With the arrival of winter rains, a stream that in the drier months is nothing more than a trickle will become big enough to drift boat, with bright fish moving into the system after each high water event. 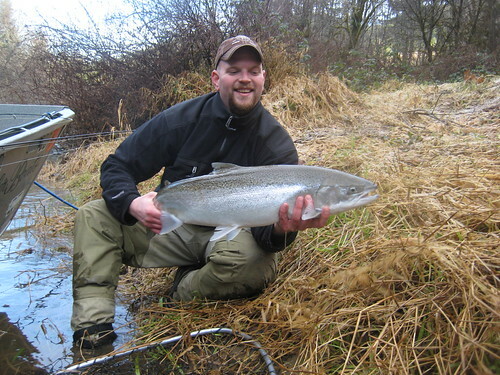 Any kind of fishing can be fickle, but winter steelheading with a fly rod can be especially so. The weather and water conditions in the winter can be, to say the least, dynamic. Each river or stream will generally fish best when the water is neither very high, nor very low. 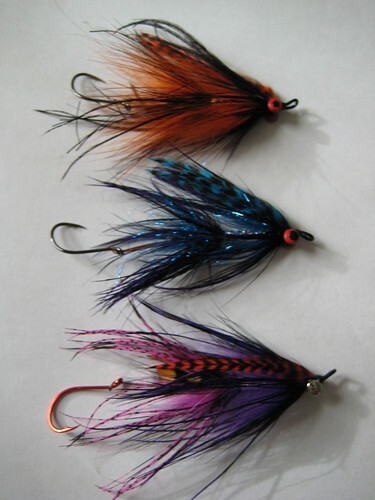 Smaller rivers and streams will start to fish well within a couple days of a major rainfall as the water clears from a mocha color to the magical shade of green fishermen dream about. Within another couple days, however, the water on these smaller creeks will become too low for navigations and good fishing. 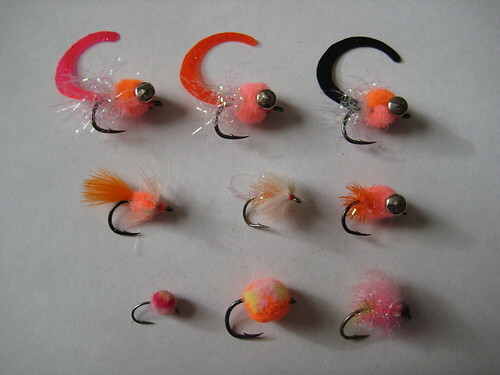 If conditions remain dry, most fishermen and guides will start to fish the larger rivers. 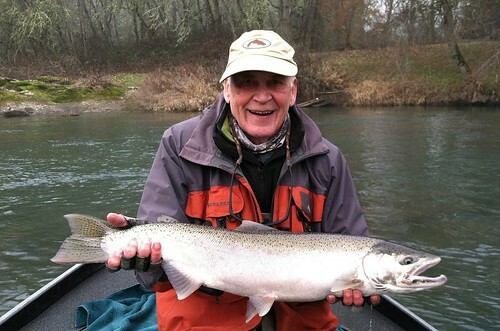 Some of the biggest rivers, like the main-stem Umpqua, need as much as two weeks without rain before they will clear enough for good fishing with artificial flies. One of the keys to successful winter steelheading is having some familiarity with various rivers in your area of different sizes and paying very close attention to water levels and conditions. As you learn each stream, try to figure out what flows are optimal, then track the water levels and weather on the internet to figure out how to best target your efforts. 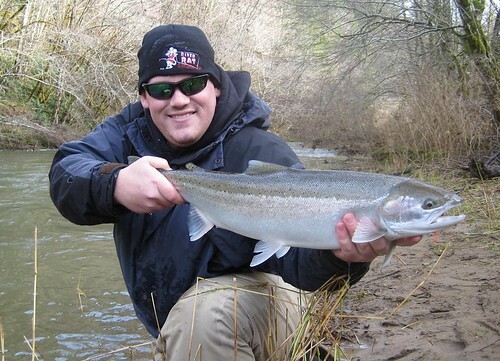 The pursuit of winter steelhead can certainly be challenging: the fish may be here one day and gone the next, icy roads may make your morning drive to the river dangerous and the fishing itself unpleasant. It is indisputable, however, that the rewards can be huge. 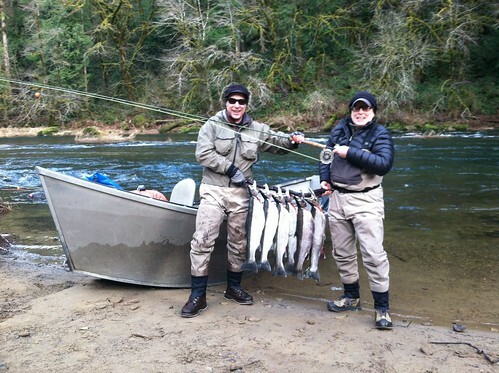 The winter is the most dynamic and interesting season of the year to be a fisherman in Oregon. There are dozens and dozens of streams and rivers all along the coast range which are worth careful attention. Pick your battles and have fun out there.